2008 was quite a year. I had just gotten back into collecting full time the year before and I had a plan to collect smartly. I had spent 2007 fully immersing myself into catching up with what I had missed since 1994, which was the last time I had devoted myself to full time collecting. I had always dabbled in a pack or a team set here and there, but 2007 was when I flipped the switch. I studied the patterns of releases and the different aspects of each. Not much had changed in the last few years. When it was announced that each card company was subject to a set cap that year (meaning there could only be a certain number of card releases in a calendar year), I figured that this would be the year that I fine tune and streamline my collecting, so I could maximize getting the cards I wanted. It was great in theory. 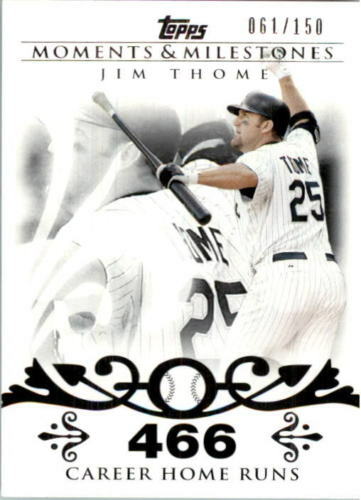 Topps Moments & Milestones threw me for a loop when it was introduced in 2007, but I adjusted and really came to appreciate the set for its uniqueness. I chose to collect one card from each of the serial numbered cards. It didn't matter what that first number was. Only the second. It was the easiest way to collect each card in the milestone run. I made it even easier by only collecting the White Sox cards. So I knew that Moments and Milestones were going to be a challenge, but an obtainable one. I decided that since I enjoyed the 1959 Topps set so much and I had my collecting down to a science, I would collect the entire set of Topps Heritage. Another semi-difficult, but obtainable goal. Upper Deck threw out a new insert set called Yankee Stadium Legacy. There would be cards for every game played in Yankee Stadium. I wasn't going to touch that set, but I figured that I really enjoy history and research, so I decided to collect only the cards featuring games against the White Sox. More difficult, but again, obtainable. Let's count the ways that the card companies foiled my best collecting plans, shall we? The Yankee Stadium Legacy proved to be way more difficult than originally thought. The insert set was spread out over several releases, including at least one that was out of my price range for a pack buy. I would have to rely on second hand sellers and traders more than I had planned. When these cards first came to the secondary market, some of the prices were outrageous, partly because of the players on the card, partly because there was a contest to complete. I still have a laundry list of cards to complete my White Sox set. I had come very close to completing the Topps Heritage set. I had decided to go after the two gimmick cards because I was so close. Then Topps announced the first ever high series in a Heritage set! That was great! Then I found out that the cards would be distributed as inserts in the Topps Update set. I still have eighteen cards for the regular set and thirty-six cards in the update set before my Heritage is complete. This isn't including the insert sets or the White Sox cards that I have for the team sets. Moments & Milestones would have been a challenge in a normal year, but with everything else that came out and the difficulty of obtaining the cards I wanted, the set became almost a burden to collect. I have many, many cards left to collect for Moments & Milestones, which is sad because there are only three players that I am collecting in the set. Then to add insult to injury, Upper Deck came out with Documentary, which documented every game for the season. It was a great idea, which I actually wanted. The set had its shortcomings with how much thought was put into photo choices, but it was still pretty cool. But alas, it was another bulky set to pile onto my collecting list. I can't even imagine what 2008 would have looked like if I collected every card in every set. The adversities in collecting goals all go away with that rush you get from getting closer to completion. It's an exhilarating feeling, that can only be topped by completing a set. 2008 nearly broke me, but it taught me many valuable lessons in how to collect. I still love the hunt for these cards. I still get the same thrills when I get another card to add to the binder. Still I will be happiest when I can finally leave 2008 behind.